Kylie Kwong's steamed prawn dumplings (wontons) with ginger, spring onion and vinegar dressing have been on her menu at Billy Kwong for 14 years. 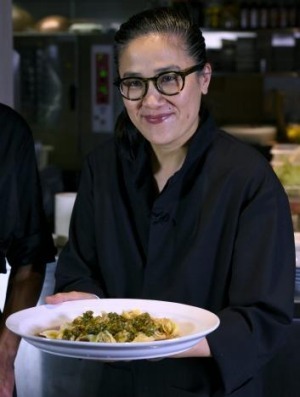 "The dish is loosely inspired by my travels through the Sichuan region," she says. "There's this amazing sauce called 'strange flavoured sauce' and it has finely sliced ginger, coriander, garlic and chilli through it, so this dressing is loosely inspired by that." "I love the fresh, silky texture, the amazing mouthful-sized pieces, and the comforting nature of dumplings," says Kylie Kwong, in her new Potts Point location. "At Billy Kwong when we make these dumplings we use my Uncle Jimmy's wonton wrappers. I give him the organic flour and the organic eggs and he makes a special version for the restaurant." Finely slice your spring onions. "Because this is a raw dressing, all of the ingredients must be sliced as finely as you can get them," Kwong says. Include the coriander root, as well as the leaves. They're the strongest part. It doesn't matter if you choose brown rice vinegar or malt vinegar. "Just make sure it's good quality," she says. When you taste the dressing, you're looking for "a little bit of sweet with the chilli coming through, and the saltiness of the soy". Once you've removed the veins from your prawns, keep the tails and heads in the freezer to use in stock. Make sure your prawn meat cubes aren't too small. "The last thing you want is to bite into a mushy prawn wonton," Kwong says. When adding your sliced spring onions to the filling, remember that you only want to slightly flavour the prawns, because the dressing is so powerful. You can use Chinese sherry, but even the red from last night's dinner will do. The sesame oil can be omitted if you are cooking for someone with allergies. The filling can be made a day ahead and left it in the fridge. When filling the wontons, place the mixture in the centre of each wrapper, and take extra care not to overfill them. It's best to turn the wontons onto their base, Kwong says. "To show off their wonton-ness and beauty." 1. For the dressing, combine soy, coriander, ginger, spring onions, white sugar, vinegar and both oils in a bowl and set aside. 2. For the wontons, peel and devein prawns, then dice prawn meat, you should have about 150 grams of diced prawn meat. Combine prawn meat with remaining ingredients, except wonton wrappers, in a bowl, cover and refrigerate for 30 minutes. 3. Bring a large saucepan of water to the boil. Make wontons, see below for instructions. Drop wontons, in batches, into the water and cook for two minutes, or until they are just cooked. To test, you will need to remove one using a slotted spoon and cut into it with a sharp knife to see that the prawns are cooked through. Remove wontons with a slotted spoon and drain. Repeat process with remaining wontons. 4. Arrange wontons on a platter and serve immediately, drizzled with dressing. 1. Place a rounded teaspoon of the filling in the centre of a wonton wrapper. 2. Dip your finger in water and moisten the bottom edge of the wrapper. 3. Fold the wrapper in half, toward you, to enclose the filling. 4. Press lightly to seal. 5. Hold the wonton lengthways between your hands with the folded edge facing down. 6. Fold the sealed edge of the wonton back on itself then lightly moisten one corner of the folded edge with water. 7. Finally, taking the two ends in your fingers, bring them together with a twisting action, and press them lightly to join. 8. Repeat with remaining filling and wrappers.